Motivação para o prémio:"for the art of memory with which he has evoked the most ungraspable human destinies and uncovered the life-world of the occupation." Patrick Modiano was born on July 30, 1945, in Boulogne-Billancourt, a suburb of Paris. His father was a businessman and his mother an actress. After leaving school, he studied at Lycée Henri-IV in Paris. He took private lessons in geometry from Raymond Queneau, a writer who was to play a decisive role for his development. Already in 1968, Modiano made his debut as a writer with La place de l’étoile, a novel that attracted much attention. 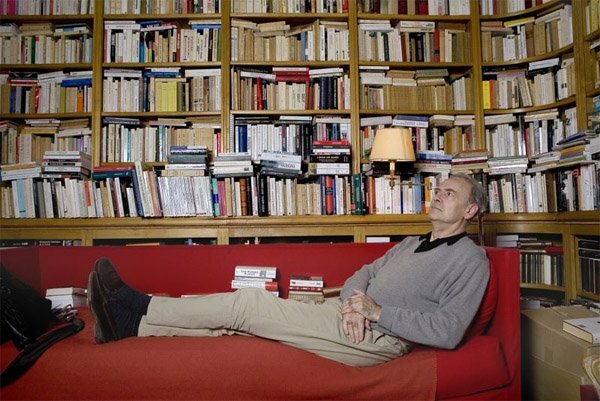 Modiano’s works centre on topics such as memory, oblivion, identity and guilt. The city of Paris is often present in the text and can almost be considered a creative participant in the works. Rather often his tales are built on an autobiographical foundation, or on events that took place during the German occupation. He sometimes draws material for his works from interviews, newspaper articles or his own notes accumulated over the years. His novels show an affinity with one another, and it happens that earlier episodes are extended or that persons recur in different tales. The author’s hometown and its history often serve to link the tales together. A work of documentary character, with World War II as background, is Dora Bruder(1997; Dora Bruder, 1999) which builds on the true tale of a fifteen-year old girl in Paris who became one of the victims of the Holocaust. Among the works which most clearly reveal an autobiographical character one notes Un pedigree from 2005. Some of Modiano’s works have been translated into English, among them Les boulevards de ceinture (1972; Ring Roads : A Novel, 1974), Villa Triste (1975; Villa Triste, 1977), Quartier perdu (1984; A Trace of Malice, 1988) and Voyage de noces (1990; Honeymoon, 1992). His latest work is the novel Pour que tu ne te perdes pas dans le quartier (2014). Modiano has also written children’s books and film scripts. Together with the film director Louis Malle he made the feature movie Lacombe Lucien (1974), set during the German occupation of France. Emmanuel Berl : Interrogatoire / par Patrick Modiano ; suivi de Il fait beau, allons au cimitière / Emmanuel Berl. Schulte Nordholt, Annelise, Perec, Modiano, Raczymow : la génération d’après et la mémoire de la Shoah.